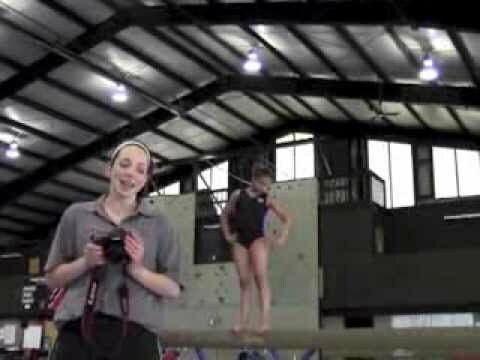 Rebecca Sykes, from Gym Momentum Camp and Syked Photography shares tips on how to shoot photos in the gym. Starting with the Hardware. Had a lot to say here, only I noticed the video was from 4 years ago, so I am cutting it to this. I am guessing that is a 5D Mk 1 based on it not having a model ID on the lower section of the body. As a full frame camera it handles low light significantly better than the more common APS-C cameras. So basically, while your advice that lenses are the more important investment, for anyone that is shooting indoor sports it would be wise to grab a full frame camera to go along with it (unless overall quality isn't as much an issue. Parents can make due with grainy shots). That Mk1 probably handles ISO 1250 like a Rebel handles ISO 200-400 from the same era. The MKIV can shoot as high as 6400 with minimal noise, while the APS-C class will still struggle at 400-800 on modern cameras. In poor light, a full frame like the 5D or 6D with a F4-5.6 lens will outperform any APS-C camera with F2.8 lens for action photography on any day. Lesson I am learning fast with my 80D as my niece starts indoor sports. But it is expensive for all that. 5D mkIV is 3500 new (or less if you know where to look), and a "cheap" 24-105mm F4L is another 1000 on top of that, or 1500 for the 24-70mm F2.8, or 1250 for the 70-200mm F2.8. It would probably be cheaper for a group of parents to hire a photographer to take photos of the kids playing and just rely on them to get good shots, while using their cell phones or cheapies to get low quality but probably usable photos.